From griddled renditions at greasy spoons to gussied-up, gourmet creations name-dropping five different farms, burgers are the true American pastime (baseball, you had a good run). And because you never want to find yourself too far from a great one, we picked the best examples of beef between buns in 15 Austin neighborhoods. $15 for a burger?! 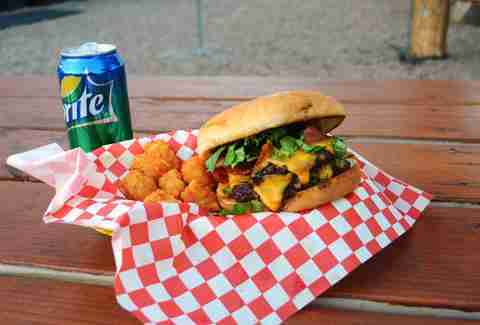 Yes, the prices in Austin can be increasingly maddening, but this is no ordinary burger. If you head into Bartlett’s on the weekend for lunch, you can get the Texas Burger, with an elephantine, impossibly juicy patty topped with cheddar and onions, then drenched in firehouse chili. It doesn’t get more Texan than that. The fact that you won't need another meal for a while helps offset the cost. 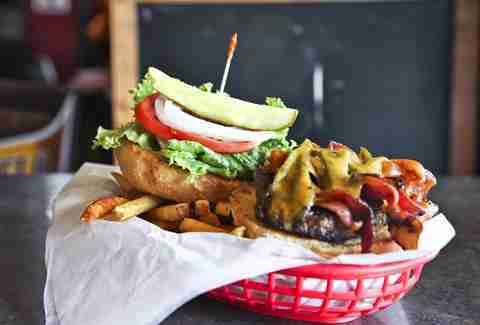 With fantastic food coupled with an equally fantastic patio, this Austin staple isn't going anywhere, and the burgers stand out on the crowded menu. They are all made with a 1/2lb of fresh Black Angus beef and piled high with fresh toppings. 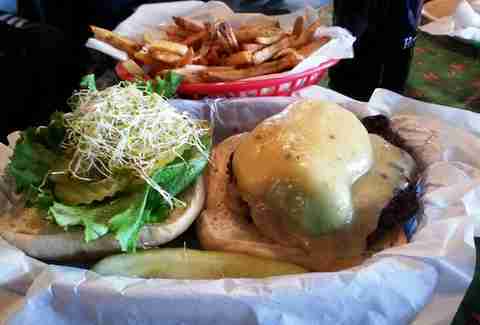 Go with the Nouveau South Austin and you’ll wonder why you never employed hummus as a burger topping in the past. 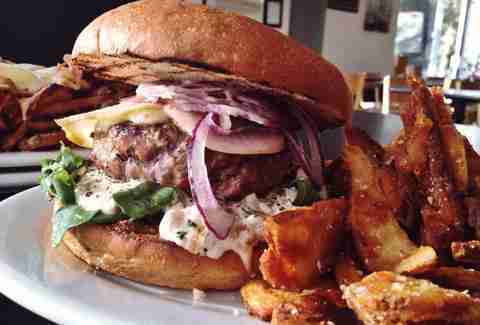 A relatively new entrant onto the scene, El Sapo's a damn-fine bar with even better burgers. Located in a former burger joint, El Sapo is reviving the space and doing things big with their "Cantina" burgers (Tex-Mex fusion burgers), as in throwing a bean tostada on as a topping to provide a delicious added crunch. Sure they offer breakfast all day, but why go that route when you can go with a stacked burger on a freshly baked pain au lait bun? Life really doesn’t get better than the bacon avocado burger with charred poblano and a generous helping of smoked aioli. This is another relatively high price point, but you definitely get your money's worth. 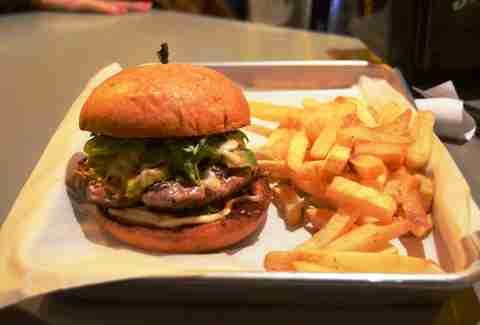 Burgers and craft beer belong together, and few places marry the two better than Black Star Co-op. 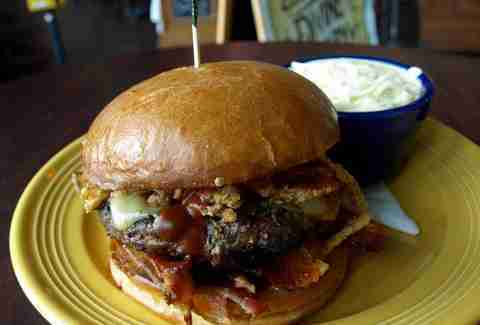 The burger is made with freshly ground brisket, which adds a smoky, juicy flavor that takes things to another level. 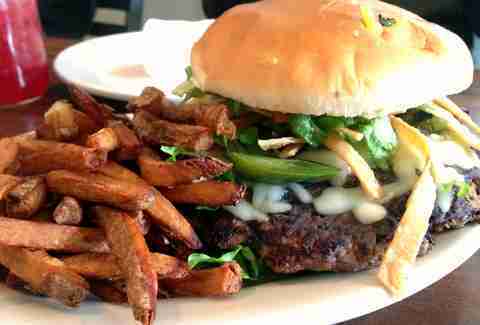 It may seem like a no-frills burger, but Black Star makes simplicity taste like royalty. The seasoned chips deserve a nod as well because they toss the hot wedges in salt, pepper, and garlic which makes them a perfect sidekick. Order a beer and prepare not to talk to anyone for a while. From celeb chef Kent Rathbun, Jasper’s brings you gourmet backyard cuisine, which is great since we all know backyards have a storied history of turning out great burgers. But probably nothing THIS great. 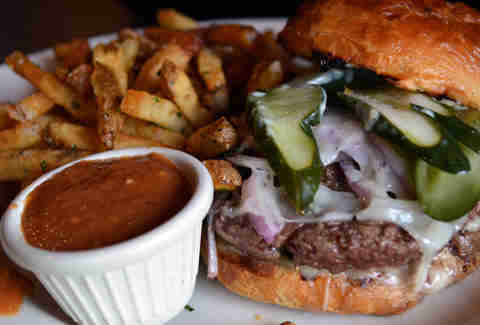 Their Lonestar tenderloin/brisket burger could well be the official state burger. The insanely delicious fresh-ground patty is topped with creamy pepper jack cheese, Shiner Bock-braised onion, and ancho chili BBQ sauce. The burger is not for the faint of heart, literally or metaphorically. Located in the heart of Dirty 6th, The Jackalope isn’t your usual shot bar. Expect to find a tat-heavy dive bar crowd happily eating some of the best burgers in town (in one of the most competitive burger zones in town). The chipotle bacon cheeseburger might contain a month's worth of fat and calories, but one bite and you will immediately conclude it was all worth it. These guys continue to amaze their patrons. They finally have a set menu, but the cooks come up with weekly burger specialties that keep people coming back for more. They've impressed with the pork patty Navasota, a banh mi burger, and the latest Tres Puerco Burger. No matter what you go with, you'll be pleased, especially if you tack on some sweet potato tots and a cold beer. Not a wine fan? 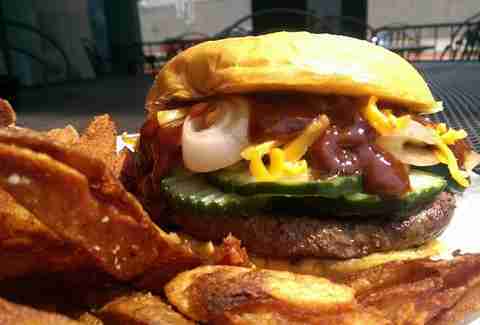 Don’t worry, Vino Vino is also home to the Nine 2-12 burger. The patty is made from ground Wagyu beef from Strube Ranch and it is topped with melted Holy Cow cheese and house-made pickles -- all on top of a kolache bun. You might be wondering about the name. Sadly 9pm-12am is the only time you can get this burger, so when you want this potentially life-altering experience, you'll have to eat a bit late. Big Daddy isn’t here to play. They have a huge selection of well-executed burgers, but when you’re ready to really show your love for burgers, step up to the Monster Burger Challenge. 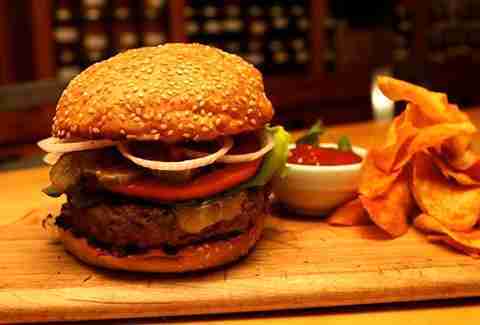 Do you think you’re man enough to take on a 3lb patty topped with cheese and fixings? If you can finish it in 33 minutes you can get your name on the wall, a Big Daddy's T-shirt, and your meal is free. Hopefully your health insurance is in order. This little food truck is making some huge burgers. 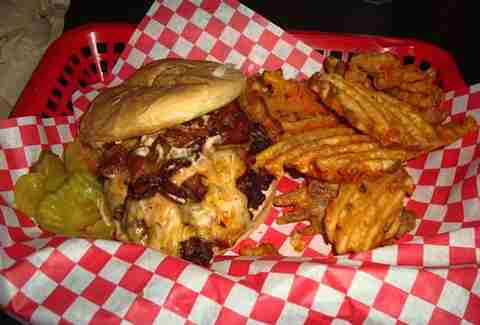 The Spare Tire is a burger that may wreck your waistline, but it will make your taste buds overrule any such concerns. Double meat, double cheese, bacon, and fried pickles make this one of the greatest times you will ever have while getting fat. While you’re eating outside, you might as well go for a walk so you can make room for another burger. Opal Divine’s is popular for a reason, with an expansive beer selection and alluring happy hour specials. Burger-wise, choosing between the Bandera and the Southwest is always a challenge, but there really is no loser. 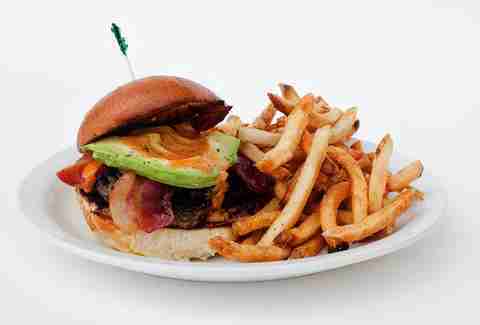 The bacon and guacamole mix together like best friends on the Southwest while the fried onions and BBQ sauce make the Bandera pop. No matter which burger you pick, you will be completely satisfied. 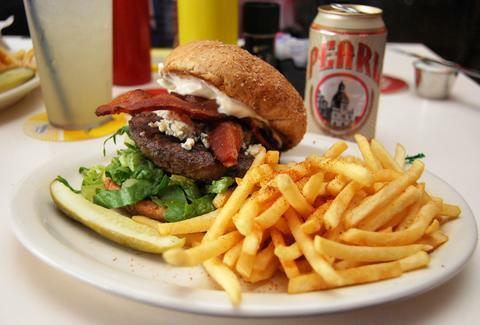 Billy’s is not only known for their great beer choices, but their burgers are second to none. Inside, the place has the vibe of a bowling alley grill, but that’s where the similarities end. The Uptown Burger with blue cheese, creamy avocado, and bacon marmalade is a flavor party that you definitely want to attend. The Cobra Burger with bacon, grilled jalapeño, cheddar, and chipotle mayo will make you want to channel your inner GI Joe and destroy it. Round Rock is finally getting some love. There may not be a bunch of options in the area, but luckily HomeField Grill is there to fill your void. Don’t think they are half-assing anything here. They make 1/2lb burgers with meat from Texas legend Nolan Ryan (like, he's the purveyor, not... no, that's gross). 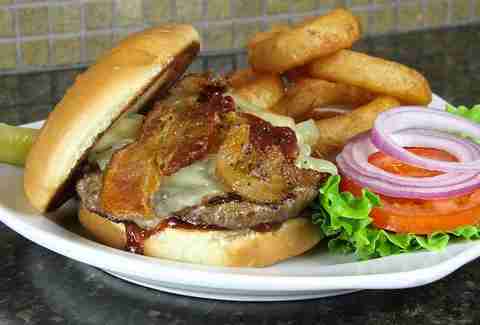 The Bubba Burger is fully stacked with bacon, caramelized onions, BBQ sauce, and white cheddar on top of a sweet Hawaiian roll. The burgers at Black Sheep Lodge may be limited, but that doesn’t change the fact that they are awesome. If you head out on a Wednesday night for $1 can beers, you can score one of their juicy burgers and a couple of said beers for under $10. The meat is seasoned and grilled to perfection while stacked with fresh veggies. 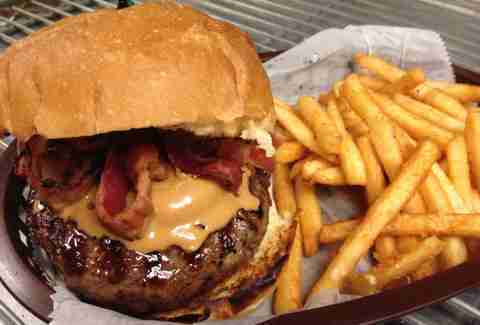 Or, for something a little different, go for a peanut butter & bacon-topped Elvis.